On the north-facing wall of Kismet, a multimedia production studio in the Bates-Hendricks neighborhood, is a tribute to graffiti artist Cue. Known as the “Prince of 16th Street,” Cue’s influence on graffiti in Indianapolis can be seen throughout the city. After his death in 2016, local graffiti artists and fellow Cool Boys crew members Mitch, Rich, and Italy created this mural in honor of their friend. This mural was created by graffiti artist Detour as a continuation of the Infamous with Style 20th Anniversary Mural. Dose, Sacred, 6Cents, and Detour are local graffiti artists that make up part of the Infamous with Style (IWS) crew. Founded in 1995 by Dose and Creep, IWS was one of the original Indianapolis graffiti crews. At various times, IWS had members from NUA, KA, HFX and S2L, all graffiti crews that had previously worked in Indianapolis. Without the necessary leadership, however, each member eventually dropped from IWS and the group disbanded. In 2004, IWS reorganized and refocused their goals: to create pieces, raise the bar as much as possible, and have no leader. Since then, IWS has produced several murals and commissions, proving that every graffiti writer needs a good partner with similar goals and tastes. 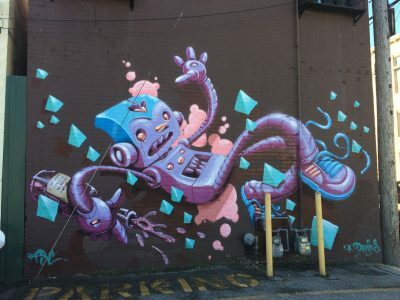 This robot was painted by graffiti artist Devious (Cincinnati, OH) as a part of the annual Subsurface Graffiti Expo in 2012. Subsurface is an event that showcases mural and graffiti artists from all over America and beyond. Since 2002, artists have traveled to Indianapolis every Labor Day weekend to create work and build community. Subsurface seeks to advance the art form through beautifying and revitalizing the landscape of the Fountain Square neighborhood specifically. Subsurface also seeks to raise social and cultural awareness and promote the arts as an institution of empowerment for all involved. Rubén “Like One” Aguirre is a Chicago based painter who has transitioned from graffiti writer to abstract painter and contemporary muralist. This black and white mural was designed and created during the 2015 Subsurface Graffiti Expo. Subsurface is an annual event that showcases mural and graffiti artists from all over America and beyond. Since 2002, artists have traveled to Indianapolis every Labor Day weekend to create work and build community. Subsurface seeks to advance the art form through beautifying and revitalizing the landscape of the Fountain Square neighborhood specifically. Subsurface also seeks to raise social and cultural awareness and promote the arts as an institution of empowerment for all involved. Like One has produced a number of murals in the Chicagoland area, across the U.S., and in Brazil. Like One’s work is an intersection of abstract graffiti, design, and contemporary muralism. With traces of typographic letter structure from his graffiti roots, his work is informed by architecture and plays with re-imagining public space, while investigating pattern, texture, and color field through the use of the spray can. This carries through his studio work while further exploring materials i.e., latex, wood, paper. He has exhibited in The National Museum of Mexican Art, the Hyde Park Art Center, and the Chicago Cultural Center. This mural was created in collaboration with local business 20 Past 4 & More and FAB Crew, aka the Fantastic Aerosol Brothers. Spanning the entire side of the building, this creative depiction of a young man with magical powers brings bold design and bright colors to the structure. This mural is representative of the many unique characters 6Cents and Sacred317 have created over their 17 years together as Fab Crew. Though both are trained in fine art and commercial design, graffiti art remains the driving force behind their creativity. 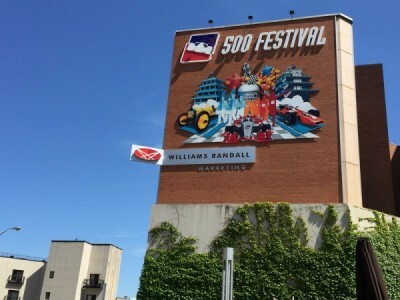 The FAB Crew has been commissioned to create murals for Klipsch, the NFLPA, Hot Box Pizza, IndyGo (for whom they painted two buses), Red Bull, Pabst Blue Ribbon, the Indianapolis Motor Speedway, as well as many others. Dose, Sacred, 6Cents, and Detour are local graffiti artists who make up part of the Infamous with Style (IWS) crew. This 20th Anniversary medallion represents the group’s long-term career as bright, bold, and dynamic group of artists working together. 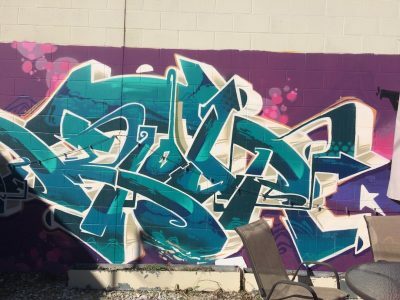 Founded in 1995 by Dose and Creep, IWS was one of the original Indianapolis graffiti crews. 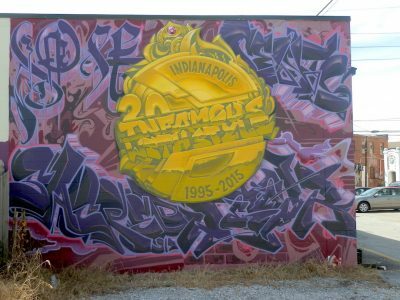 At various times, IWS had members from NUA, KA, HFX and S2L, all graffiti crews that had previously worked in Indianapolis. Without the necessary leadership, however, each member eventually dropped out of IWS and the group disbanded. In 2004, IWS reorganized and refocused their goals: to create pieces, raise the bar as much as possible, and have no leader. Since then, IWS has produced several murals and commissions, proving that every graffiti writer needs a good partner with similar goals and tastes. As part of the 2017 Indy Do Day, Indianapolis’ It’s My City coalition partnered with local artists and volunteers to create temporary and semi-permanent pavement murals throughout Indianapolis. Most of the murals were made of chalk and were designed to last just a few days, but as part of its neighborhood engagement efforts, Big Car Collaborative worked with artists to create murals in the Garfield Park neighborhood that would stay fresh-looking for up to a year. Indianapolis-based artist William Denton Ray painted this mural for the Garfield Park Art Center in its large parking lot, originally the site of a swimming pool when the park was first built. 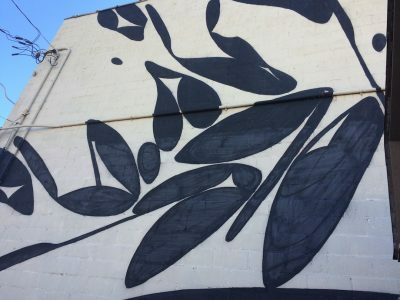 The mural includes four 30′ x 10′ stylized leaves that are designed to be graphic in nature and also provide a visual direction towards the Art Center’s entrance, which can be difficult for patrons to find. The original design was a teal-green color; however, after the artist discussed the palette with the Friends of Garfield Park, the decision was made to change it to shades of red. 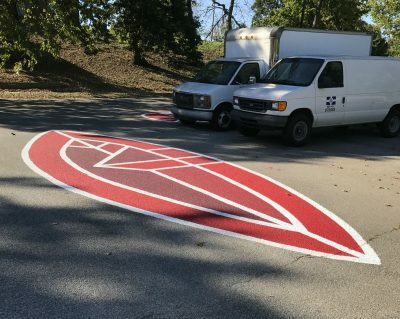 The design was laid out by the artist and filled in by the staff of local digital marketing company Trendy Minds, with additional volunteers from Eli Lilly as part of the Lilly Global Day of Service on September 28. To finalize the design, Ray painted the white outlines to make all the reds pop. The 9/11 Memorial was dedicated exactly ten years after the historical events to honor those killed in the terrorist attacks of September 11, 2001 in New York City. 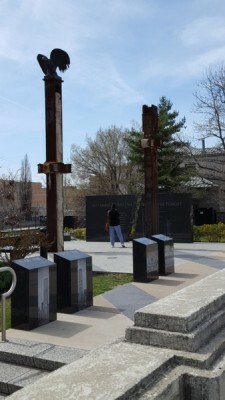 The memorial, which is set overlooking the Downtown Canal, contains two 11,000-pound beams from the World Trade Center’s twin towers that were destroyed in the attacks; a pair of six-foot tall black granite walls inscribed with remembrances of the events in New York City, Washington, D.C., and Shanksville, Pennsylvania; four smaller granite markers inscribed with images and descriptions of four key events of September 11 and the times they occurred; and a bronze, life-size sculpture of an American bald eagle perched on one of the beams, with wings outstretched and gazing east in the direction of the events of that tragic day. There are also four benches in the plaza, which are replicas of benches in the World Trade Center plaza, and seven Indiana native flowering trees, symbolizing the seven buildings of the World Trade Center complex. A specimen redbud tree stands directly opposite the granite wall as a Freedom Tree, its bold color representing the resolve of the American spirit. 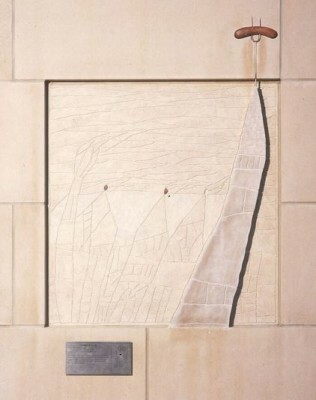 The granite wall has a large, jagged gap between its two halves, to symbolize the United States being torn apart on September 11, 2001. Inscriptions on the wall and around the memorial highlight the emotions felt on that day and expressions of hope and unity. The memorial was the culmination of Project 9/11, an effort by Indianapolis resident and firefighter/paramedic Greg Hess. Hess had served on Indiana Task Force 1, one of the first emergency responder teams to arrive at the site of the terrorist attacks to assist local teams with rescue and recovery. The memorial was produced entirely through private donations and in-kind contributions. The plaza and its elements were designed by Bill Cotterman of Gibraltar Design, Inc. His intention was to recreate, both emotionally and symbolically, the experience of being at the World Trade Center site. Sculptor Ryan Feeney, who is also an Indianapolis firefighter, and his co-worker Donald Mee created the bronze eagle. 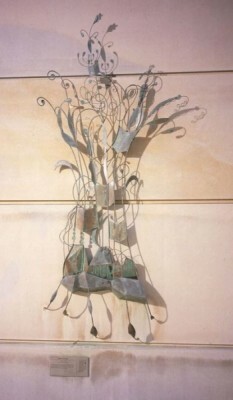 This bronze sculpture depicts an abstract forest and swampland communicated through wire and cut medal shapes. A rustic cabin rises originally, resembling an exotic plant with books for leaves. A patina on the bronze has made this sculpture turn green, contributing to the organic feel. This piece depicts the self-designed home of winter/naturalist Gene Stratton-Porter. Designers Jeff Laramore and David Jemerson Young of 2nd Globe, an Indianapolis –based artistic company designed all 92 and the county sculptures featured on the outside of the Indiana State Museum. Their designs narrate the counties’ famous natives, historically significant events, or their fabricated and installed by various Indiana sculptors, carvers, class workers, metal workers, and other artisans. This sculpture depicts an abstract tree trunk encircled by fragmented red arrows jutting out in various directions. The circle rests in a bed of horizontal lines forming a rectangle. 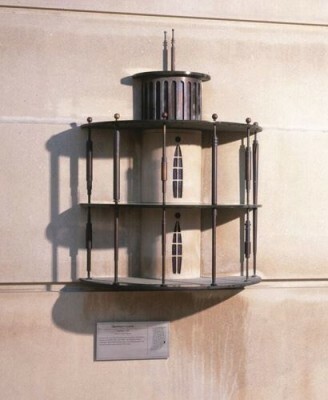 The composition is made out of cast red glass, bronze, and steel. 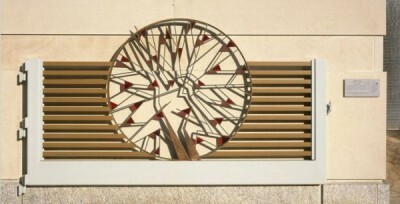 The icon attempts to communicate an apple tree in tribute to Johnny Appleseed, and the arrows pelting a fort, symbolizing the historic conflict in Allen County among the British, French, Native Americans, and American Settlers. This icon also contains a camouflaged form of a Native American archer, drawing his bowstring taut. Designers Jeff Laramore and David Jemerson Young of 2nd Globe, an Indianapolis–based artistic company designed all 92 and the county sculptures featured on the outside of the Indiana State Museum. Their designs narrate the counties’ famous natives, historically significant events, or their fabricated and installed by various Indiana sculptors, carvers, class workers, metal workers, and other artisans. This 40-inch stainless steel sculpture is an abstract engine crankshaft. There are exhaust pipes on the structure’s side. A narrow spire atop the piece’s crest mimics the steeple of Columbus’ North Christian Church, erected in 1864 by architect Eero Saarinen. All of the objects are uniquely significant in supporting both industry and art. Designers Jeff Laramore and David Jemerson Young of 2nd Globe, an Indianapolis–based artistic company designed all 92 and the county sculptures featured on the outside of the Indiana State Museum. Their designs narrate the counties’ famous natives, historically significant events, or their fabricated and installed by various Indiana sculptors, carvers, class workers, metal workers, and other artisans. 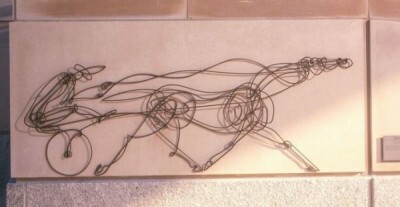 The Bronze rod sculpture was origially sketched as a continuous line. 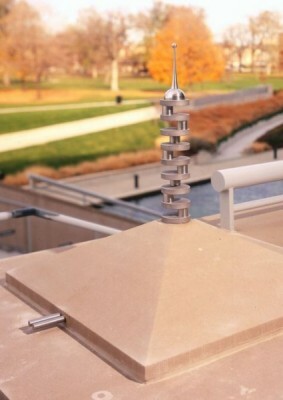 It is constructed from lengths of 1/4″ bronze rod. A viewer may begin at any point on the piece and trace around it, eventually arriving back where he/she started–duplicating the circuitous nature of a horse race itself. Each line expresses movment through the curves and simplicity of the shaped bronze rod. Designers Jeff Laramore and David Jemerson Young of 2nd Globe, an Indianapolis–based artistic company designed all 92 and the county sculptures featured on the outside of the Indiana State Museum. Their designs narrate the counties’ famous natives, historically significant events, or their fabricated and installed by various Indiana sculptors, carvers, class workers, metal workers, and other artisans. This vibrant blue flame is crafted from hand-colored blue glass. The lower round portion sits at an angle and the curved lines continue to a point at the top. There is a small tear shaped object that is white located directly above the pointed tip. An interior tear shaped object that is white located in the center of the blue flame. 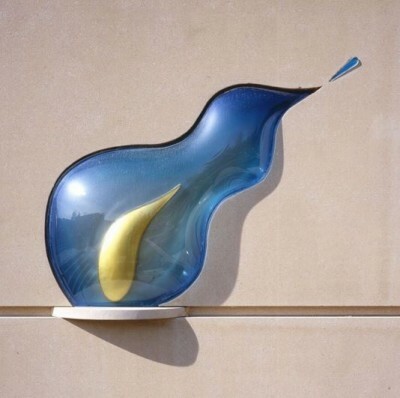 The combination of glass and oil history in Blackford county combine to represent its growth through the sculpture. Designers Jeff Laramore and David Jemerson Young of 2nd Globe, an Indianapolis–based artistic company designed all 92 and the county sculptures featured on the outside of the Indiana State Museum. Their designs narrate the counties’ famous natives, historically significant events, or their fabricated and installed by various Indiana sculptors, carvers, class workers, metal workers, and other artisans. This sculptures eighth vast pillars allude to the towering limestone columns of the Boon County Courthouse in Lebanon, designed by architect Joseph T. Hutton. In this piece, a band encircling several of the columns acknowledges the Second Principal Meridian, a survey line used to create township boundaries after the U.C. Congress’ Land Ordinances of 17985. Atop one column, a small bronze ball serves as a head, transforming the pillar into a whimsical hula-hooper. Designers Jeff Laramore and David Jemerson Young of 2nd Globe, an Indianapolis–based artistic company designed all 92 and the county sculptures featured on the outside of the Indiana State Museum. Their designs narrate the counties’ famous natives, historically significant events, or their fabricated and installed by various Indiana sculptors, carvers, class workers, metal workers, and other artisans. The delicate limestone leaves in this piece’s background represents Brown County’s many acres of beautiful colored, scenic woodlands. 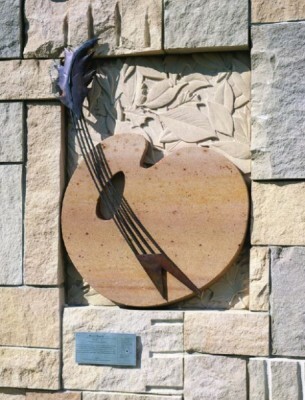 A brown sandstone palette pays tributes to the artists and crafts people in Brown County. The palette in this artwork also doubles as a mandolin body. 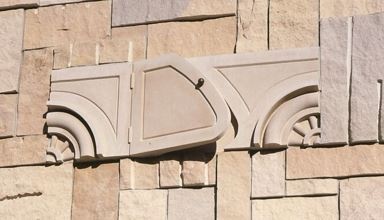 The sandstone used in this sculpture was obtained from a recently reopened Parke County quarry in Mansfield, IN. 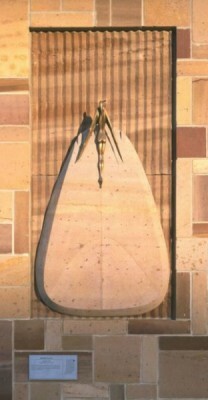 The materials used are sandstone, limestone, and silicon bronze. Designers Jeff Laramore and David Jemerson Young of 2nd Globe, an Indianapolis–based artistic company designed all 92 and the county sculptures featured on the outside of the Indiana State Museum. Their designs narrate the counties’ famous natives, historically significant events, or their fabricated and installed by various Indiana sculptors, carvers, class workers, metal workers, and other artisans. This sculpture is against a ridged, patchwork background—emblematic of the county’s formidable farming heritage—bronze soybean pods rest alongside a sparkling, tiled lake. The structure’s blue ceramic echo the rippling waters of Lake Freeman. 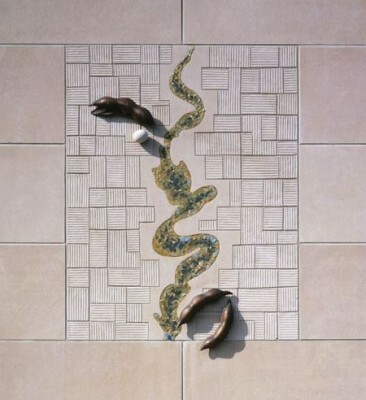 The porcelain tile was glued into the artwork after being broken up with hammers. Small white triangles in the piece represent the boats of contented sailors. Designers Jeff Laramore and David Jemerson Young of 2nd Globe, an Indianapolis–based artistic company designed all 92 and the county sculptures featured on the outside of the Indiana State Museum. Their designs narrate the counties’ famous natives, historically significant events, or their fabricated and installed by various Indiana sculptors, carvers, class workers, metal workers, and other artisans. Crossing paths in this all-limestone sculpture form a distinctly horse-like shape, making reference to a colorful carousel that arrived in Cass County circa 1919. The intersections of various lines suggest the area’s early influence as a significant Midwestern transportation center. The limestone’s smooth qualities enhance the curved lines portraying the horse-like shape on a carousel. Designers Jeff Laramore and David Jemerson Young of 2nd Globe, an Indianapolis–based artistic company designed all 92 and the county sculptures featured on the outside of the Indiana State Museum. Their designs narrate the counties’ famous natives, historically significant events, or their fabricated and installed by various Indiana sculptors, carvers, class workers, metal workers, and other artisans. 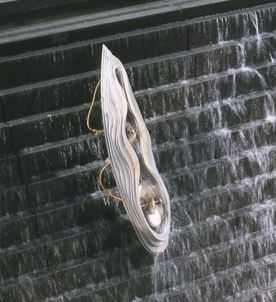 This piece is located in a steeply inclined fountain west of the museum’s main entrance. It was assembled from layered, laser-cut metal frameworks and resembles a paddlewheel steam boat making its way, fish-like-, upstream. The lines of the ascending steamboat, designed to simulate a raised topographic map, reflect the hilly landscape of sounthern IN. Designers Jeff Laramore and David Jameson Young of 2nd Globe, an Indianapolis–based artistic company designed all 92 and the county sculptures featured on the outside of the Indiana State Museum. Their designs narrate the counties’ famous natives, historically significant events, or their fabricated and installed by various Indiana sculptors, carvers, class workers, metal workers, and other artisans. 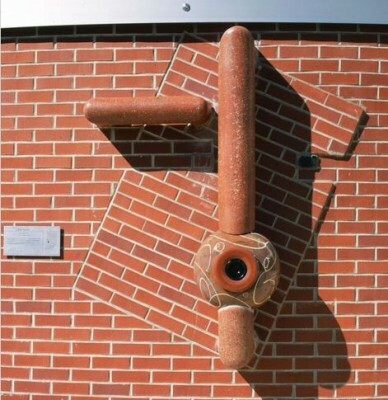 This piece is protruding slightly and a slanted square of brick is directed by a ceramic piping and painted pottery. The arrangement of elements in this sculpture suggest a stylized human face. A single lump of black coal near the piece’s right edge pays homage to the area’s rich coal deposits. Because Clay County has some of the state’s richest coal deposits, mining in the region has been important since the 18500s. A fine grade of clay discovered in the 19th century has supported a number of pottery and brick factories. Designers Jeff Laramore and David Jameson Young of 2nd Globe, an Indianapolis–based artistic company designed all 92 and the county sculptures featured on the outside of the Indiana State Museum. Their designs narrate the counties’ famous natives, historically significant events, or their fabricated and installed by various Indiana sculptors, carvers, class workers, metal workers, and other artisans. Clinton County’s sculpture tells the story of “Old Stoney”, a castle-like Frankfort landmark that opened in 1892. 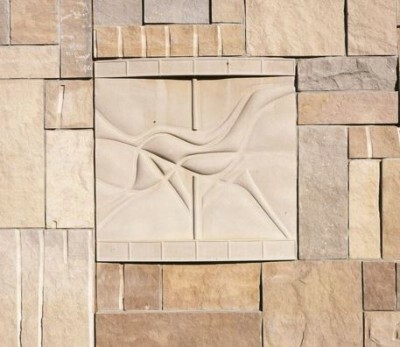 The markings in the scored limestone are minimalist, but depict a building and a skyscape. A red frankfurter toasts on the fork-like tower of the imposing building. Designers Jeff Laramore and David Jemerson Young of 2nd Globe, an Indianapolis–based artistic company, designed all 92 of the county sculptures featured on the outside of the Indiana State Museum. Their designs narrate the counties’ famous natives, historically significant events, or their cultural characteristics, and were fabricated and installed by various Indiana sculptors, carvers, glassworkers, metalworkers, and other artisans. The popular Marengo and Wyandotte Caves are in Crawford County, drawing tourism for their history and natural beauty. While Marengo Cave seems never to have been inhabited, Wyandotte Caves show extensive evidence of use by Native peoples as a mine for the chert used in arrowheads and other tools. The sculptural icon is in the shape of a deep hole, with two arrow-headed staffs merging at the center and seemingly holding the cave open–or reaching towards each other from top and bottom. 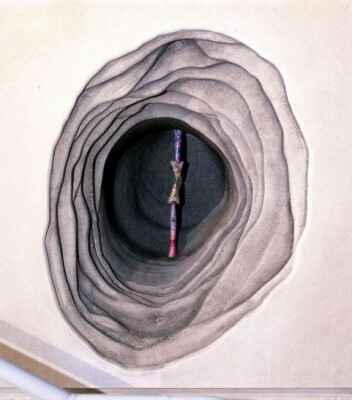 Its subterranean subject matter relies on negative space for its impact rather than a raised three-dimensional form. 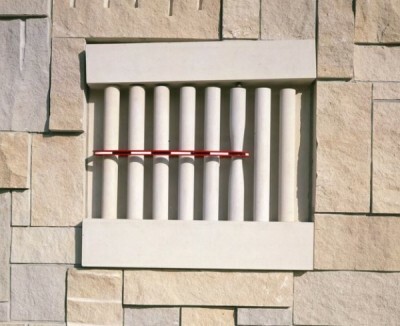 The wood, copper, and limestone materials are layered to create the illusion of depth. The outer rings are roughened to give the sculpture a timeless look. Designers Jeff Laramore and David Jemerson Young of 2nd Globe, an Indianapolis–based artistic company, designed all 92 of the county sculptures featured on the outside of the Indiana State Museum. Their designs narrate the counties’ famous natives, historically significant events, or their cultural characteristics, and were fabricated and installed by various Indiana sculptors, carvers, glassworkers, metalworkers, and other artisans. 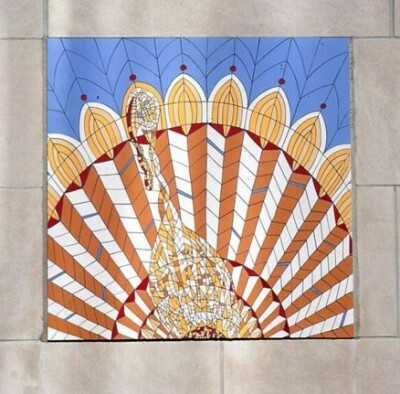 This piece depicts a mosaic of colorful ceramic tiles creating the pattern of a large, fan-tailed turkey, acknowledging the agricultural heritage of Daviess County. The turkey’s tail simulates a quilt pattern, paying tribute to the county’s sizable Amish population. The slightly asymmetrical placement of the tiles has lent this sculpture a human element. There are blue tiles in the upper portion with small blue bits scattered thought. Yellows, oranges, reds, and white fill the mid to lower areas. Designers Jeff Laramore and David Jameson Young of 2nd Globe, an Indianapolis–based artistic company designed all 92 and the county sculptures featured on the outside of the Indiana State Museum. Their designs narrate the counties’ famous natives, historically significant events, or their fabricated and installed by various Indiana sculptors, carvers, class workers, metal workers, and other artisans. This sculpture depicts a streamlined, bronze hood ornament gliding nobly over a bed of freshly plowed farmland in the background. This piece salutes Auburn’s automobile industry as well as farming. The brown and tan colors used create a harmonious combination for the arrangement of objects. Designers Jeff Laramore and David Jemerson Young of 2nd Globe, an Indianapolis–based artistic company designed all 92 and the county sculptures featured on the outside of the Indiana State Museum. Their designs narrate the counties’ famous natives, historically significant events, or their fabricated and installed by various Indiana sculptors, carvers, class workers, metal workers, and other artisans. This three dimensional structure has steam-piston-like objects that line the periphery of the piece, a tribute to the ornate steamboats that once traveled the nearby Ohio River. This structure resembles “floating palace” used to transport industrious Thomas Gaff’s goods. The porch of his two-story bears a more-than-passing resemblance of the deck of a steamboat. Designers Jeff Laramore and David Jameson Young of 2nd Globe, an Indianapolis–based artistic company designed all 92 and the county sculptures featured on the outside of the Indiana State Museum. Their designs narrate the counties’ famous natives, historically significant events, or their fabricated and installed by various Indiana sculptors, carvers, class workers, metal workers, and other artisans. This three dimensional asymmetrical sculpture has an elongated spire-which, in turn, sprouts small bronze tree from its tip. It appears to be growing organically out of the museum’s wall. 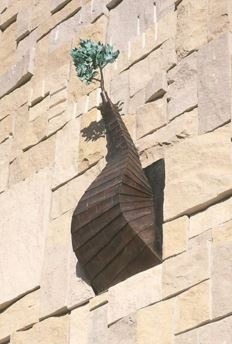 The bronze tree has been treated with a patina, causing it to turn green. This piece commemorates the series of large-tooth aspen trees that have grown atop the Decatur County Courthouse. Designers Jeff Laramore and David Jemerson Young of 2nd Globe, an Indianapolis–based artistic company designed all 92 and the county sculptures featured on the outside of the Indiana State Museum. Their designs narrate the counties’ famous natives, historically significant events, or their fabricated and installed by various Indiana sculptors, carvers, class workers, metal workers, and other artisans. This particular piece has a unique combination of jarred pickles and one jarred Garfield character. The series of eight pickle-filled jars, a ninth container holds a baffled image of the famously gluttonous Garfield the Cat. A lighthearted tribute to Delaware County, this piece commemorates the home canning and glass jar industries. 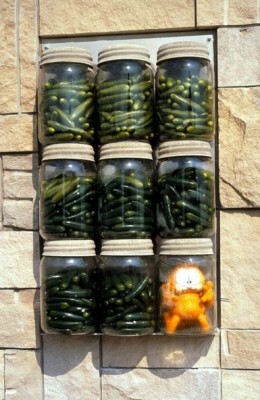 Pickles were chosen as the jarred vegetables of this piece due to the contrast of their green color with the bright orange Garfield. Designers Jeff Laramore and David Jameson Young of 2nd Globe, an Indianapolis–based artistic company designed all 92 and the county sculptures featured on the outside of the Indiana State Museum. Their designs narrate the counties’ famous natives, historically significant events, or their fabricated and installed by various Indiana sculptors, carvers, class workers, metal workers, and other artisans. With one drawer slightly ajar, this smooth limestone cabinet stands in sharp contrast to the rough limestone surrounding it. Dubois County is home to large manufacturers of pianos, organs and furniture, and this piece reflects the area’s woodworking tradition, Since the region is also one of the state’s largest poultry-producing counties, the drawers in this piece are designed to resemble carved limestone eggs. 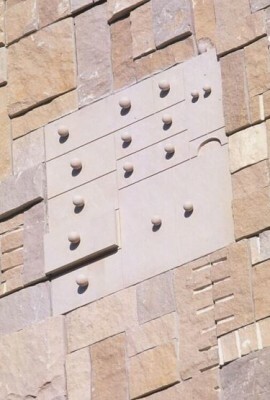 Through texturally different, the shapes an size of the drawers on this piece are similar to those and the size of the limestone in the wall surrounding them. In 1997, Dubois County produced 1,687,356 turkeys and ranked first among Indiana counties in raising poultry. Dubois County is also a large manufacturer of Pianos, organs, and office and home furniture. Designers Jeff Laramore and David Jameson Young of 2nd Globe, an Indianapolis–based artistic company designed all 92 and the county sculptures featured on the outside of the Indiana State Museum. Their designs narrate the counties’ famous natives, historically significant events, or their fabricated and installed by various Indiana sculptors, carvers, class workers, metal workers, and other artisans. 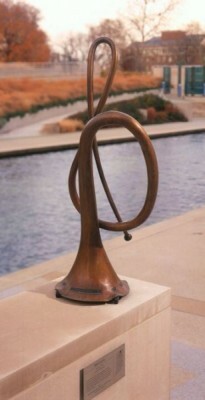 This piece depicts a twisted bronze horn wrapping itself into the musical symbol of a treble clef. Elkhart County is considered the “band capital of the world” as well as a hub for recreational vehicle fabrication. There are small wheels and windows at the base of this piece to acknowledge the more than 200 firms in the area that manufacture RV-related products. Designers Jeff Laramore and David Jameson Young of 2nd Globe, an Indianapolis–based artistic company designed all 92 and the county sculptures featured on the outside of the Indiana State Museum. Their designs narrate the counties’ famous natives, historically significant events, or their fabricated and installed by various Indiana sculptors, carvers, class workers, metal workers, and other artisans. In Fayette County’s piece, an antique car’s ornately carved door stands slightly ajar. Due to the forests that originally stood here, the region attracted many furniture manufacturers in the early 1900s. In addition, Connersville was once home to automobile manufacturers. The bronze handle on the car door simulates a cabinet knob. Designers Jeff Laramore and David Jameson Young of 2nd Globe, an Indianapolis–based artistic company designed all 92 and the county sculptures featured on the outside of the Indiana State Museum. Their designs narrate the counties’ famous natives, historically significant events, or their fabricated and installed by various Indiana sculptors, carvers, class workers, metal workers, and other artisans.